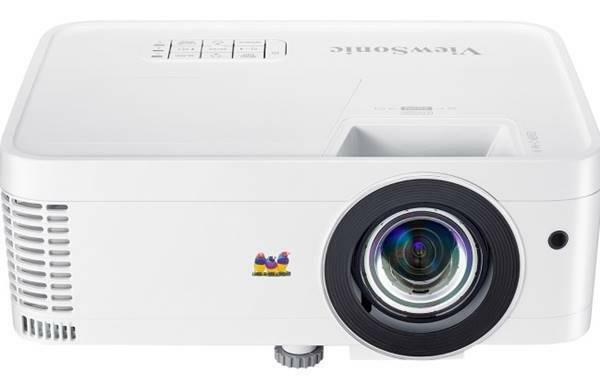 The ViewSonic PJD5112 is a DLP-based, 3D-ready, SVGA (800x600) projector rated at 2600 lumens. Because it's 3D-ready, it might seem more appropriate as a home entertainment projector for 3D games or video, but teachers and business presenters know that anything that can grab a viewer's attention is worth using. More important, it doesn't take a crystal ball to predict that if 3D succeeds at all it will quickly work its way into business and education software. That's enough to make the PJD5112 worth considering for business or classroom use. While you're waiting for 3D software to materialize, you can use the PJD5112 as the reasonably portable (5.7 pound) projector that it is while paying no premium for it being 3D-ready. Though it is $679 direct from ViewSonic, it can be found for as little as $449 on the street. ViewSonic says it works with its distributors to arrange education discounts, which vary from one distributor to the next. Brighter than advertised. The PJD5112 is one of the few projectors that's actually brighter than its rating. We measured it in its brightest mode at 2747 lumens, 106% of the 2600 lumen rating. It's easily bright enough to stand up to the typical level of ambient light in a classroom or office. Wide range of brightness. The projector's seven preset modes also deliver a wide range of brightness levels suitable for different lighting conditions. We measured the least bright mode at just 435 lumens. In addition, with any given mode, you can drop the brightness -- plus extend the lamp life and lower the projector's power draw -- by setting the lamp to Eco mode. Good basic connectivity. The back panel of the PJD5112 offers more connectors than many portable projectors. There are two VGA ports that can both connect to either a computer or component video source, a third VGA port for monitor pass-through, S-Video and composite video ports, and stereo miniplugs for audio input and output. A USB port will let you connect to your computer for controlling the mouse from the remote, and also update the projector's firmware. There's also an RS-232 port to let you control the projector from a computer and a 12 volt DC connector that you can use, for example, to control a retractable screen automatically when you turn the projector on and off. great article can u pls tell me, can i connect iphone to ViewSonic PJD5112 SVGA DLP Projector? pls reply thank u. You can purchase a cable for your iPhone on eBay under $30. The cable let's audio and video play throug, you will be able to get (yellow) video out to RCA/composite of the projector. Red & White can be plugged into sound with yet another adapter you can find on eBay. comprei um projetor view sonic igual o modelo acima, gostaria que alguem me ajudasse, seria possivel liga-lo ao blu ray e ter o efeito 3d? preciso de algum adaptador ou cabo? nemhum vendedor soube me informar...o blu ray é 3d, mas que saida ligo no projetor? Google translation to English: I bought a view sonic projector like the model above, I would like someone to help me, it would be possible to turn it on blu ray and have the 3d effect? need some adapter or cable? seller knew anythig tell me ... what is blu ray 3d, but I turn on the projector output?